For the Peanut Butter Pudding: Have ready six, 8 to 10-ounce clear glasses. Whisk together the sugar, cornstarch and salt in a large saucepan. Slowly whisk in milk until dry mixture dissolves; then whisk in cream. Bring to a boil over medium heat, whisking frequently. Once it boils, whisk almost constantly and boil for about 30 seconds or just until it begins to thicken. Quickly whisk in peanut butter and continue to boil for about 1 to 2 minutes or until thick. You should be able to see whisk marks. Whisk in vanilla. Cool for about a minute then divide equally among glasses. Refrigerate while you make chocolate pudding. For the Milk Chocolate Pudding: Whisk together the sugar, cornstarch, cocoa and salt in a large saucepan. Slowly whisk in milk until dry mixture dissolves; then whisk in cream. Bring to a boil over medium heat, whisking frequently. Once it boils, whisk almost constantly and boil for about 30 seconds or just until it begins to thicken. Quickly whisk in chopped chocolate and continue to boil for about 1 to 2 minutes or until chocolate melts and the mixture is thick. You should be able to see whisk marks. Whisk in vanilla. 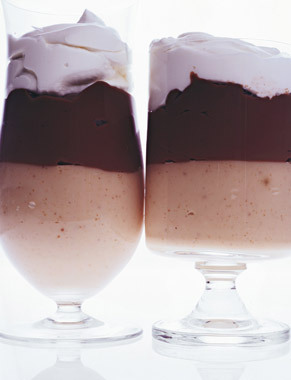 Cool for about a minute then carefully spoon into glasses on top of peanut butter pudding. Refrigerate until chilled and thick, at least 2 hours. Glasses may be covered with plastic wrap and puddings can be refrigerated 1 day ahead. For the Whipped Cream: Whisk together cream and sugar until soft peaks form. Place dollops on puddings right before serving.